Description The doom asteroid has dropped... run, jump and claw your way to survival! Escape the pyroclastic wall of doom and find your dino sanctuary! AWSD or Arrow keys move the dino. Or use a combo of both. SHIFT key gives you a speed boost and recharges every 20 seconds or so. Press down while jumping for an air attack, which is useful for many things. You must duck to eat things on the ground. The game can be played in CHALLENGE or SPEEDRUN mode. It defaults to challenge, which is a collection of 7 levels. Speedruns can be unlocked and chosen in the OPTIONS screen. You need Bones to unlock speedruns (and buy goodies). 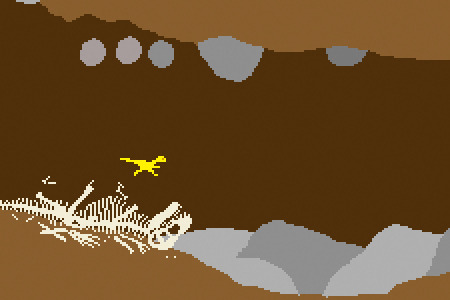 You get bones by eating critters and reaching milestones. Earn DNA by collecting eggs and eating critters. Use your DNA to upgrade your dino. The game is DEEP so EXPLORE and have fun! Awesome retro #game! It's a lot of fun, and well-designed.